Our humanoid entertainer and guide robot REEM is in Yas Island (Abu Dhabi)! Robot REEM is shooting an adventure film about the Golden Key treasure hunt there (REEM the ROBOT: The Quest to find the Golden Keys). This hunt is based on an event that is currently going on in the Yas Mall: people can look for the Golden Keys hidden all around the mall, and when finding any key, they are rewarded with different valuable prizes. You can find the film trailer below, which has just been released today. Just released: robot REEM’s film trailer! Robot REEM loves moving around the Yas Mall and meeting new people. She is enjoying her summer there interacting with all the curious people that come around her, especially children, who are amazed by her. 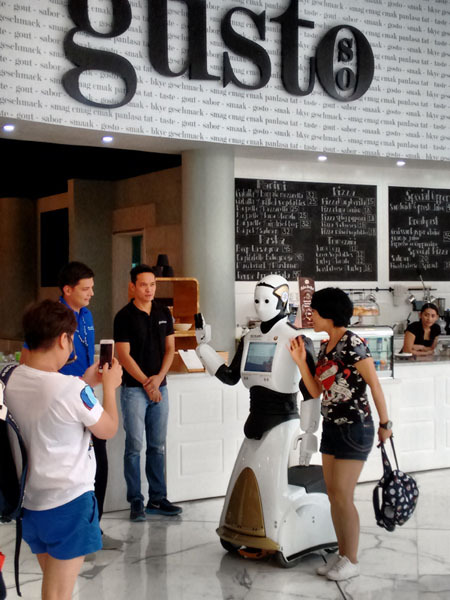 Even when she’s on holidays, our service robot likes to talk to all the locals and tourists that are shopping or eating at the mall, and to take pictures with them. REEM is most of the time at the Yas Mall’s cascade dining area. She has already been to some restaurants of the mall, to the Ferrari World… – she has even gone the cinema to watch the last Terminator film in 3D!